NASHVILLE, TN — On the day of the controversial decision to pull out of the Paris Agreement by President Donald Trump, the Belcourt Theater hosted the documentary From the Ashes discussing the perils of climate change. The documentary is a compelling look at coal and the mining industry which debuted to rave reviews during the Tribeca Film Festival and was recently acquired by National Geographic. 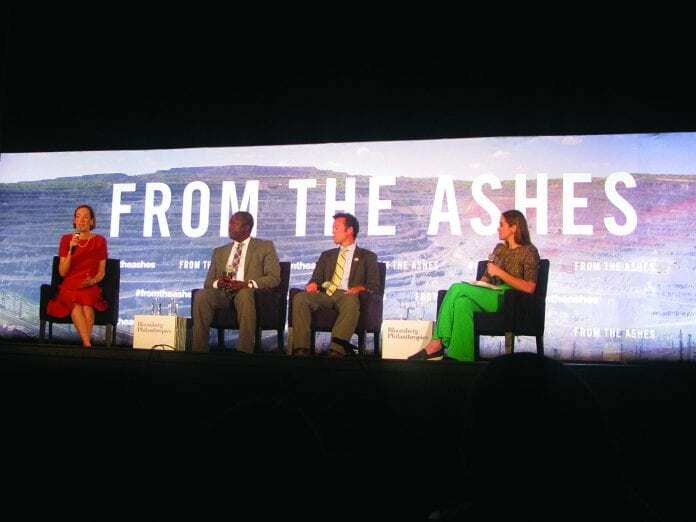 Produced by the Academy Award- and Emmy-winning production company RadicalMedia, in partnership with Bloomberg Philanthropies, From the Ashes captures Americans in communities across the country as they wrestle with the legacy of the coal industry, and what its future should be under the Trump administration. From Appalachia to the Powder River Basin in Montana and Wyoming, the film goes beyond the rhetoric of the “war on coal” to present often-heartbreaking stories about what is at stake for our economy, health and climate. Introduced by Mayor Megan Barry, she discussed Nashville’s commitment to climate change by continuing the city’s efforts towards cleaner power through the Livable Nashville Committee. This committee is tasked to develop a new, prioritized list of ambitious goals and recommendations that reflect the Green Ribbon Committee’s work, NashvilleNext and other related plans, and Mayor Barry’s priorities. Subcommittee focuses include Natural Resources, Waste Reduction and Recycling, Green Buildings, and Climate and Energy. The committee released recommendation for the city in February 2017. Mayor Barry is a signatory to the Compact of Mayors, the world’s largest cooperative effort among mayors and city officials to reduce greenhouse gas emissions, track progress, and prepare for the impacts of climate change. “We looked at what we can do in Nashville…Liveable Nashville will take a hard look at what we can do here because as we saw today, the federal government is not going to lead, cities are going to have to lead,” the mayor said to an audience of local politicians, grassroots organizers, environmental lawyers and members of the Livable Nashville Committee. The screening was followed by a panel-discussion moderated by Amanda Little, Journalism Professor at Vanderbilt, and featured the views of Ben Gilmer, President of Refresh Appalachia, Mary Ann Hitt, Director of the Sierra Club’s Beyond Coal Campaign, and local Environmental Toxicologist Dr. Sanmi Areola. They discussed the implications of withdrawing from the Paris Agreement, and efforts in Nashville to limit coal use and the health implications of the Coal Ash in Gallatin TN. Panelist Mary Ann Hitt, a native of East Tennessee, discussed how grassroots organizations play the biggest part in improving the country’s dependence on coal. “Thinking about having grown up in the Smoky Mountains…thinking about the journeys of the people in this movie, I was feeling pretty emotional about what those words mean to my daughter- that they were withdrawing from the Paris Agreement- and then I remembered what I did for a living and I remember those ladies in North Carolina, and the ladies in Dallas, TX, and the folks with the Coal Field Development Corporation…we have made a revolutionary transformation in this country in how we make energy. We were getting half of our energy from coal ten years ago; it is now down to 30%. Renewable energy has revolutionized the electric sector and that has been driven by people like the people in the movie. Like people right here in Tennessee… It is those grassroots folks that have made me hopeful, and it is those grassroots organizations who are responsible for the changes, not the politicians in Washington, and they are going to be responsible for the progress going forward,” she said.